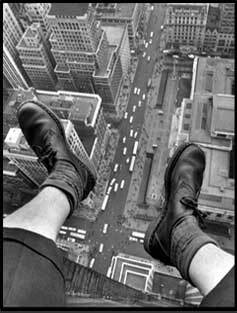 Top: Pigeon man, --a suicide's view of 5th avenue was Grey Villet's first image for LIFE* magazine in 1954. With no connections, little money, and a new wife who was expecting a child. he spent most of his time bending iron for a furniture wholesaler until he approached the personnel department at Time Inc. with his portfolio...They sent him to see John Bryson, then picture editor at Life who saw talent in his work and gave him the test assignment still titled in Life records as "Pigeon Man"
elevator to a 55th floor and asked a group of office workers on lunch break to “take a picture out the window.” Folding his 6’4”frame out onto the narrow ledge,he leaned forward to shoot straight down over his dangling feet before horrified office workers could pull him to safety. Bryson found the resulting 3 images on the single contact sheet that the newcomer from South Africa turned in later that day. What he saw was not just a stunning image that LIFE week as its “Speaking of Pictures,” but precisely the sort of resourcefulness the editors looked for in photographers. In retrospect, Grey’s sensational edge of the ledge image could be viewed as a metaphor for what was to follow. Not only did it speak of the courage, ambition, and inventiveness that would carry him to the top of his chosen profession, but of the heightened perspective that working for LIFE would afford him for decades to come. Within a year of being added to LIFE’s legendary roster of photographers in 1955,he won photojournalism’s most prestigious award when he was named Magazine Photographer of the Year. Other honors followed, including multiple firsts from NPPA and Gold from World Press Photo, but by the time Grey and I met on assignment in 1961 on the celebrated essay, Lash of Success, and began a working relationship that led to our subsequent marriage, ( SEE ESSAYS) he had largely abstained from competitions to focus entirely on the quality of the images he was producing rather than personal recognition. Unwilling to promote himself, he modestly rejected the idea of organizing his own retrospective only months before his sudden death in 2000. “The work will tell” he told me then, “the work will tell.”Self effacing, quiet, Grey was truly a quintessential photojournalist in the service of truth and as you may discover in the sampling of his work included on this website, the work still "tells" powerfully. 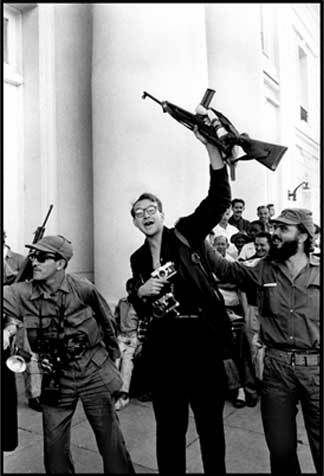 Bottom right: Grey Villet on the trail of Castro's revolution in Cuba, 1958.